Speak Hindi from Day 1 is a unique, one of its kind and an invaluable resource for attaining a high level of proficiency in Hindi. Being equipped with this resource is like having our own personal tutor with you. It is a humble attempt to help learners wade through the initial difficulties related to language learning with reduced effort and without encountering frustration. You will soon find yourself comprehending, reading, writing and speaking the language. The text is extremely well organized and thorough. The grammar structures are explained clearly and succinctly, and the examples cover every possible question a student may encounter. The text is fully transliterated. Learning the Devanagri script, though advised, is no longer a necessity. The book presents a very organized and logical method of learning and teaching. The materials contained in the book are clear, easy to understand and reinforce all aspects such as reading, writing and speaking starting from a very basic level to a level that allows the learner to debate in Hindi. Plenty of excercises with answers throughout the book. Kavita Kumar was born in 1936 in Rawalpindi (now is Pakistan). A Master’s degree holder from Delhi University, she has been teaching Hindi as a foreign language in India and abroad for more than twenty-five years to aspiring learners from all over the world. She moved to the US five years ago. Besides live lesson delivery, she works with long distance learners in other states as well as other countries by phone and skype, using study material especially designed by her for online lessons. Presently she lives in Milwaukee, Wisconsin. Speak Hindi from Day One is a complete course on learning Hindi as a foreign language. It is a highly user-friendly instructional too for learners. Learning the Devanagri script is always advisable. However, with this book, it is no longer a necessity. It contains the text both in Devanagri as well as Roman script. The book is designed with a learner in mind who wants to learn Hindi for travel or professional needs, but has no time to take short or long term formal courses at specific hours and at specific learning centers. The book helps you to learn Hindi effectively as a foreign language without straining your most valuable yet limited resource - TIME. The book has all that one needs to learn a language. Committing words to memory is a very important part of learning a new language. This book gives you words and phrases and shows you how to put them together in a meaningful order just as the native speakers would do. This is not just a phrasebook. It takes you deep into the subtleties of the language and helps you to advance from a basic level to a higher level of expertise and proficiency. It offers you a wide variety of learning material as you journey through it’s four sections, G, S, D and P.
G provides the learner with basic grammar rules followed by clear explanations and plenty of examples from day-to-day life. The learner is gradually led to foray into the complex language structures by dynamically splitting them into smaller, easier to comprehend sentence models with varied verb conjugations in al possible tenses and moods. There are examples with detailed clear explanations. Every chapter contains several exercises with self check-answers. S contains simple stories with detailed grammar analysis and cross references, thus giving the learner the opportunity to recapitulate and further fortify what has been learnt in section G.
D has dialogues based on situations encountered in day-to-day life. Natives everywhere tend to describe their point of view, their thoughts and impressions on personal, national, or global matters using idiomatic language. There is never any word-for-word translation for such expressions. Like any other language, Hindi has its own idiomatic expressions which reflect the culture and philosophical mind set of the speakers. These dialogues have been specially designed to expose the learner to the use of such idiomatic expressions and phrases. P has a small bank of situational phrases. For more in this direction refer to the author’s Hindi English Phrasebook. For more on Hindi Grammar, it’s usages and practice, refer to the author’s Hindi For Non Hindi Speaking People and the accompanying Workbook. Hindi belongs to the Indo-European family of languages. In its long journey starting with Sanskrit. Through Prakrit. Pali and Apabhrams, it came across several linguistic influences from foreign traders and political invaders. As a result, some existing sounds and syntax were dropped, while some new sounds, verb conjugations and words were taken in. Hindi uses Devanagri script which is believed to have sprung from Pracin Nagri - a derivative of Brahmi script. The development of Devanagri to its present form is believed to have begun sometime in 1000 AD. By 1200 AD the vowels, consonants and vowel symbols had become like Hindi. Some further changes by way of standardization continued to take place, and by the end of 1800. The script attained its present form. Unlike Sanskrit, Prakrit etc, the final ‘a’ ceased to be pronounced. 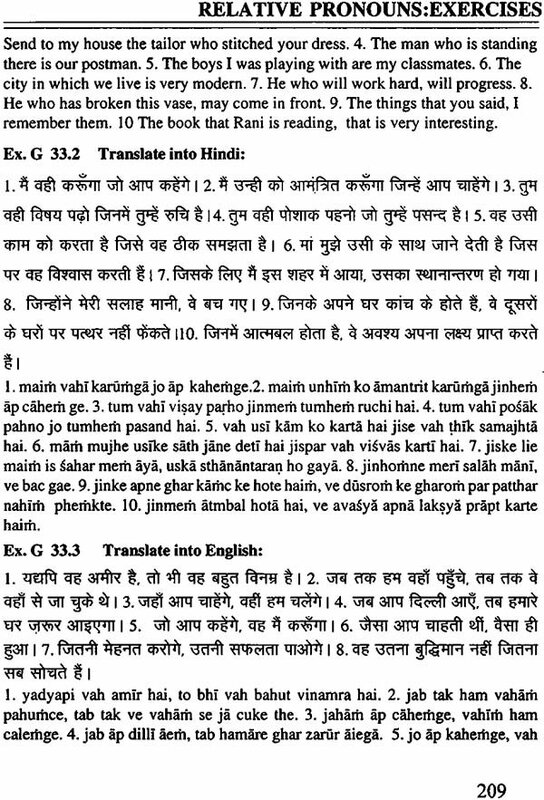 Already words from Pashto, Arabic, Persian, and Turkish had become part of Hindi. Also, the use of compound verbs and the conjunct ‘ki’ had come into Hindi through the influence of Persian and Arabic. Devanagri script is written from left to right. It has all the features of an ideal script. All possible consonant and vowel sounds are contained in the Hindi alphabet which is classified in a scientific order. Vowels and consonants are listed separately. Long and short vowels are kept together. Each vowel, long or short, has a separate character as well as a symbol form to be used when combined with consonants. Consonants, classified on the basis of the area of articulation, begin with the velars, move forward through the prepalatals. Palatals, dentals to the labials, followed by liquids, sibilants and glottal. Consonants in Hindi have five main classifications. The word used in Hindi for classification is ‘varga’. Each ‘varga’ is named after the first letter contained in it. For instance, the first letter of the first classification is ‘ka’ hence it is called the ‘ka’ varga. Based on the first letter of the flowing classifications, they are called ‘ca’ varga. ‘ta’ varga. ‘ta’ -varga and ‘pa’ - varga respectively. All classifications have five letters each; the first and third letter of each classification is non-aspirate, the second and fourth letters are aspirates. The fifth letter is a nasal consonant. In writing, the nasal consonant provided at the end of each classification precede the remaining four of its group where required, either in its character form or as a dot above the preseding letter. For complete comprehension of use of nasal consonants, see pg. 17-18. The vowel ‘a’ is inherent in all the consonants. In writing, one vowel following a consonant is affixed to it in its symbol form. However if a word requires use of more than one vowel, the following vowels are written as character. Hindi is a phonetic language and hence very easy to learn. It is read almost the way it is written. There are no silent letters; pronunciation ambiguities are rare. There are very few exceptions, and very few irregular verbs. Hindi is an accurate. Friendly and living language, generously taking into its fold new sounds as and when required. For instance, when new vocabulary came in with Muslim invaders requiring use of the sounds qa, kha ga, fa, za found in Arabic and Persian, Hindi rose to the occasion by modifying the already existing similar sounding consonants by affixing a dot underneath. Similarly, when English words came in the language, it introduced the use of a crescent-like symbol placed above the bar to assure correct pronunciation of English words such as college, doctor etc. Apart from the full stop which is a dot in English but a vertical stroke in Hindi, it took all the other punctuation symbols used in English. Since 1900, there have been considerable changes in word power and usage. Bhartendu Harish Chandra followed by several other scholars initiated the task of standardizing Hindi. This work has been being continued by the Central Hindi Institute, Delhi, and the Nagri Pracarni Sabha, Varanasi. There is growing use of tatsam words. Of the modified letters. Use of qa, kha and ga is becoming extinct. Instead qa, kha ga are used both in speech and script. The use of fa, za continues both in writing and speech since they are used in ‘English too, which is the preferred language of the modern youth particularly, and of Indians in general. New vocabulary is continuously evolving to meet the needs of a technology-based world. the use of compound verbs which already by 1800, had found its way into Hindi through the Persian and Arabic influence, has gradually increased, further fortifying the power of expressing subtle meaning and finer nuances. The Hindu view of time is cyclic and not linear as in Christianity. Christianity believes in an absolute beginning of the world order with God’s word. God’s word was the beginning and God’s word (on the day of Judgement) will be the end. Hindu view believes in the coexistence of world and Divine, and in repeated cyclic creations and dissolutions, without a beginning, with out end, each cycle leaving behind impressions (samskaras) based on previous karmas, out of which arises the next cycle. Thus goes on the entire cosmos, cycles of creation and dissolution, and not absolute creation. Time is perceived as an eternally revolving wheel without any beginning or end: hence the same words kal for tomorrow and yesterday, parsom for day after tomorrow and day before yesterday, and narsom for two days after tomorrow and two days before yesterday are used. Appropriate past or future verb endings leave no room for doubt regarding the timing of the event. The Indian perception of life in every object is imbibed through the language; hence only two genders, masculine and feminine, are recognized grammatically. Foreign students are advised to learn the gender with every new noun-word, without which correct verb conjugation is not possible. The sound of a word is the master key to gender-determination. The sages declared ‘ego’ as man’s deadliest enemy. This, along with the basic Hindu belief which admits the supremacy and omnipotence of the creator of the universe, accepts Him as the doer of all activity and assumes for the people a humble, passive role as recipients of His grace or wrath, and is reflected in the language. Several sentence constructions have the subject in the dative case (i.e. subject followed by) instead of the nominative case. For instance, while an English speaker says “I am hungry”. “I hurt myself’, or “I like it” the corresponding Hindi constructions are mujhko bhukh lagi hai, mujhko cot lagi hai, mujhko pasand hai etc. meaning respectively, “To me hunger is”, “To me injury is”, or “To me pleasing is”. Similarly, “I need” =mujhko cahie, “I know” =mujhko pata hai or mujhko ata hai etc. the underlying concept is that the subject is not actively doing the action but things are actually happening to him or coming to him. Hindi has a separate category of causative verbs corresponding to the English ‘have-passive’ structure - a long syntactic formation to express the idea of getting something done by somebody. ‘(a)’ or (va) is infixed between the existing transitive or intransitive verb roots and their (na) endings. This reflects the sociological setup with its ages-long, deeply-ingrained caste structure which has a class of people who have been recognized as existing mainly for providing service to those higher up in the caste hierarchy. Students learning Hindi as a foreign language are bound to come across several constructions which if interpreted and understood in the religio-socio-philosophical background, are easily comprehended and mastered. Hindi today is a fully-fledged, well accomplished language of the people, of journalism and literature, of law, science and business. It is the national language of India.